A few weeks ago we reported that Asaph was launching a movement that aimed to chronicle tales of Bulawayo as seen through the eyes of its youth. 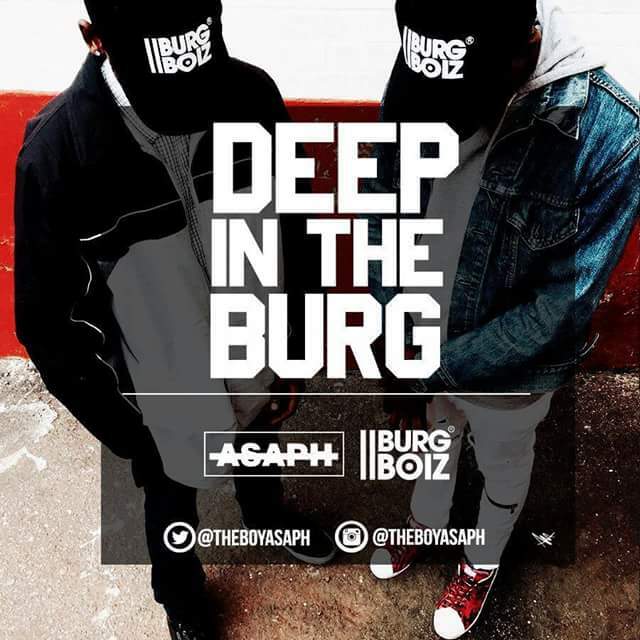 The movement aptly named Burg Boiz aims to do this through music drops,dabbling in aesthetics and dropping visuals to complement the music.We in week three of the movement now and already we have seen 3 fire joints and two videos with talk of a small film/documentary also doing the rounds.Production has been allocated to longtime Asaph producer Charlie Zimbo while Artline Films is handling visuals. Week one saw Asaph teaming with Kingsley to give us the perfect anthem for those long rides home after a night of booting with the homeboys in mummy's stolen ride or that taxi you can't really afford. It's a song bout looking your best dressed in all black for that rendezvous with fly chicks in the city centre. Its also a tale of balling on a budget and calling a meeting with your comrades in the middle of a party so you can combine forces and buy enough fuel to take you home with said chicks. Relatively unknown rapper Kingsley drops a memorable verse to complement Asaph's two. Week two saw the release of Ara Kani Jackets which is my favorite of the series thus far.Ara Kani is an ode to a local Bulawayo label owned by Nkululeko Ncube which is making strides the world over having recently showcased their newest range at the South African fashion week. But it's more than just a song about fly threads,its a story of finding shelter from a cold city and a cold country. Asaph raps about how he thought he had made it when he was booked for the Wizkid gig (VIP suite in the capital and all) only for the show to flop. The resolve to succeed is bigger than the setbacks though and he vows to keep on keeping on till he at least makes it to Zambezi Magic. MH1 lends his voice to the joint cleverly weaving a story of good girls turning to pretty ratchets and boys getting bodied by the bodies of said ladies only for hearses to be stuck in traffic.Talk about life being at a virtual standstill. The latest release is somewhat a dedication to the fair ladies of Bulawayo in particular and Zimbabwe in general.Yiso comes through with a touch of R and B that is beffiting to the song's theme. Asaph likens the ladies to birds while appreciating the yellow bones whose complexion he says is light as feathers of the aforementioned birds. He also makes a toast to those ladies who bring their cute cousins to the boot. The videos in the series are available on the Burg Boiz YouTube channel and you can follow the The Boy Asaph on Twitter,Instagram and Soundcloud.